Mobile Phones & Forklift Trucks: Bad Idea? DRIVING A ‘ROAD’ VEHICLE AND USING A MOBILE PHONE IS ILLEGAL IN MANY COUNTRIES – SO WHY CAN YOU DRIVE FORKLIFT TRUCK WHILST ON THE PHONE? In many countries, it is not considered illegal to drive a forklift truck while holding a mobile. Its down to management to take a stance against it. The first thing to do is carry out a Risk Assessment to evaluate when and if calls have to be made. This may even influence your choice of truck. It makes sense, for example, to ban drivers from taking or making personal calls while at the wheel. 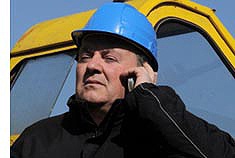 An operator may use their phone to communicate with fellow workers on a platform. This is a legitimate reason to use one and so it’s worth considering a safer communication system. You could consider a hands-free kit or something similar. Driver distraction comes in other forms, though, including drivers losing control of a truck when seeking to grab an unsecured item that is in danger of falling within the cab area. This could easily be a mobile phone, clipboard, tape measure, even something as trivial as a pen. The problem is that it’s a reflex response. It’s unrelated to the value or importance of the item. So by solving the problem at the source, will eradicate the risk of injury. When you are considering a new truck, always include in your specification the amount and quality of storage space available. Consider storage for the gear that a driver will typically carry: for example, cups, drinks cans, bottles, pens, scissors, tape dispenser, writing-pad/clipboard and mobile phone. Some new models even incorporate a litter bin and a stow-bag for the driver’s personal possessions. To reveal the threats mobile phones and other distractions have on your business, carry out a Risk Assessment. With this information to hand, it’s easy to evaluate when and – more importantly – if calls should be made. We can assist with identifying possible solutions, such as communication systems or secure storage devices.